Any standard 3D printer’s single-grip extruder also needs an idler wheel to push the filament into the teeth of the drive wheel. An idler wheel usually is a round bearing pushed by a spring or a rubber bushing. The following figure shows an idler bearing/wheel fitted to a printed lever; the spring on the left causes the bearing on the right of the image to be pushed into the drive wheel (middle), gripping the filament tightly. With a design using a bearing idler wheel, it must not be overtightened or it will squash rather than grip the filament. 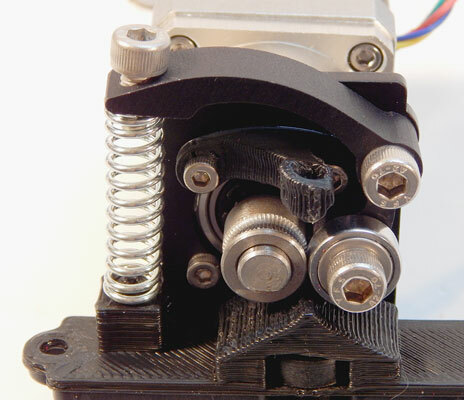 If your extruder uses the dual-drive system, in which teeth grip both sides of the filament, the bearing idler wheel is no longer required and the filament is unlikely to be squashed. The idler wheel is essential and must be tightened just enough for the drive wheel to grip the filament. Don’t overtighten the idler bearing. 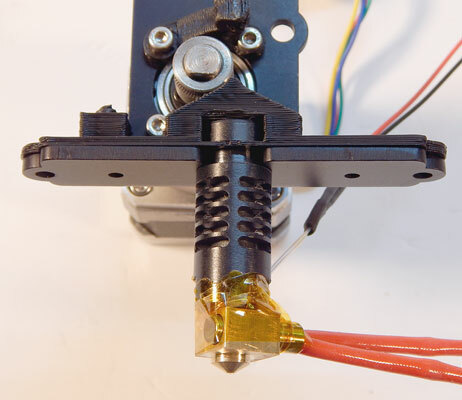 If the grip on the filament starts to squash it out of shape, the hot-end’s thermal gets harder to force down, and it may jam. Check how much the drive wheel is biting into the filament. You should see small, regular marks where the teeth bite in, and the filament shouldn’t be crushed. The hot-end normally is attached to the extruder body with bolts to allow it to be removed if the extruder jams or gets blocked. A finished extruder also requires a heating element on the hot-end, as well as a temperature sensor (see the following figure). This wiring, along with the four motor connections, must go back to the RepRap electronics wiring. A wired-up hot-end fitted to the motor and drive assembly. This figure shows a complete thermoplastic extruder with a machined gearbox. Never try to drive the motor or rotate the gears driving the filament if the hot-end isn’t at the correct temperature. Doing so can cause the extruder to strip and chew up the filament, and you have to clean the teeth on your drive wheel before you can print again. A thermoplastic extruder needs to be carefully calibrated to operate well. 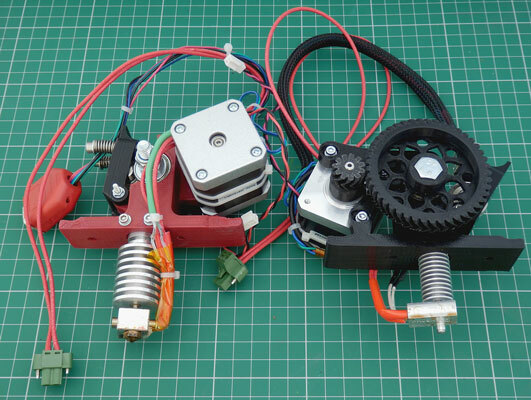 Extruders are highly active subjects of development for RepRap. Many designs exist, some more specialized than others, offering higher temperature, faster extrusion, or finer detail. Most extruders usually meet the requirements of home 3D printing with thermoplastics.